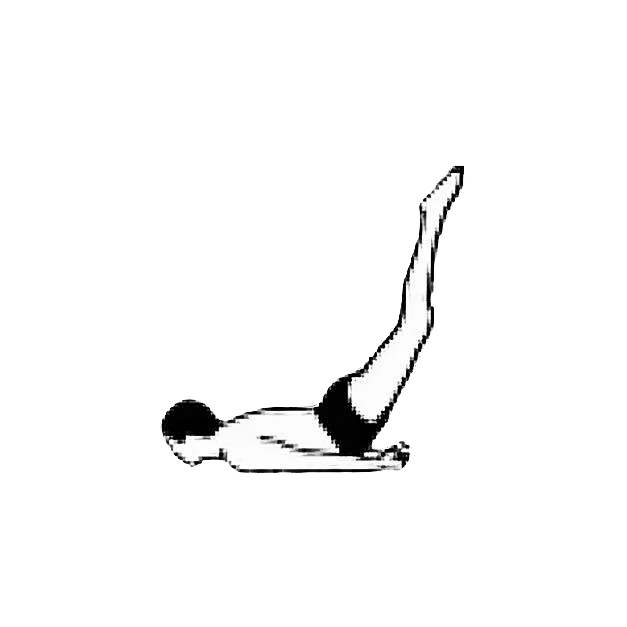 The Locust: Lying face down with lifted legs. Of all the asanas, Salabhasana is the one that works most on developing will power. According to Swami Vishnudevananda, exercising will power makes ones thoughts pure and powerful and is one of the primary goals of the practice of asanas. Unlike the other asanas which are done slowly, we achieve the Locust by making a single powerful muscle contraction, similar to that of a locust jumping. This action simultaneously brings together thought, breath, movement, and prana – vital energy. The physical benefits of this pose is that all the internal organs are massaged, especially the pancreas, liver, and kidneys. It also gives a backward bend to the spine and opens the chest, bringing an increased blood supply to the neck and throat region. Objective: Increase will power and strengthen the lumbar. Lie with your chin out, as in the Half Locust, then take 3 deep breaths. On the third, lift both legs off the ground. They may not come up far at first, but with practice you may be able to lift them much higher. Hold for as long as you can, then lower your feet. Repeat twice and then relax. This more difficult pose must be attempted only by experienced students of yoga. The aim, in the advanced asana, is to raise your feet straight up and then lower them over your head. This backward bend compresses your vertebrae while stretching the front of your body to its greatest extent. The strength and flexibility necessary for this pose will eventually develop with regular practice.